This insect probably received its common name of bed bug from its close association with human sleeping beds where it often seeks refuge during daylight, only to come out to feed on the bed’s occupant(s) at night. 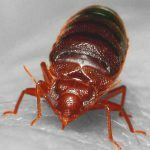 The bed bug is an ectoparasite of primarily humans but will also attack poultry, caged and invasive birds and various mammals, including rodents. When present in sufficient numbers, it is possible to detect an obnoxiously sweet or foul “locker room” odor, which is emitted from their glands. Bed bug infestations have been found in transportation vehicles such as boats (including cruise ships), trains, airplanes, and buses as well as in movie theaters where they typically harborage in seats and associated frames as well as homes, apartments and hotel rooms. They can be introduced into a structure via used furniture or in the belongings of someone who has been living in a bed bug infested situation. Adults can survive for up to 6-7 months if they are well fed. Bed bugs harbor in cracks and crevices during the day and come out to feed at night.